The story behind the disability rights case being argued in the U.S. Supreme Court on Halloween is a story about the contrast between kindness and cruelty, a story about the right way and the wrong way to treat kids with disabilities. The central characters in this story are an engaging, brave girl with cerebral palsy named Ehlena Fry, and her trained service dog, Wonder. When Ehlena was adopted by a family in a rural Brooklyn, Michigan, the community rallied around her. They contributed money and sponsored a basketball tournament at a local school to raise funds to purchase a service dog prescribed by Ehlena’s pediatrician. Thanks to this outpouring of kindness and generosity, Ehlena was able bring home a cute, hypoallergenic, certified service dog – a Goldendoodle named Wonder. Read the ACLU’s Complaint on Behalf of Ehlena Fry and Wonder. School officials and their attorney belittled the Frys when they explained that Ehlena needed the service dog to serve as a bridge to her independence, a fundamental right guaranteed by the Americans with Disabilities Act (ADA). The Frys explained that the officials could not violate her rights under the ADA and deny Ehlena a service dog just because they provided an aide. It would be like saying that a school had no obligation to build a wheelchair ramp so long as volunteers were willing to lift students who used wheelchairs up and down the stairs every day. Once the ACLU agreed to represent Ehlena, the school district allowed Wonder in school for a “trial period,” but they did not allow Ehlena to use him as a service dog. In fact, Wonder was relegated to the back of the classroom and could not accompany Ehlena to recess, lunch and other activities. Then, at the end of the school year, the district said Wonder could not return in the fall. And what a difference a school made. Unlike her old school, the public elementary school in neighboring Manchester welcomed Ehlena and Wonder with open arms. Wonder could assist Ehlena anywhere in the school and the principal and teachers used Wonder’s presence as a teaching moment to educate other elementary school students about disability rights. 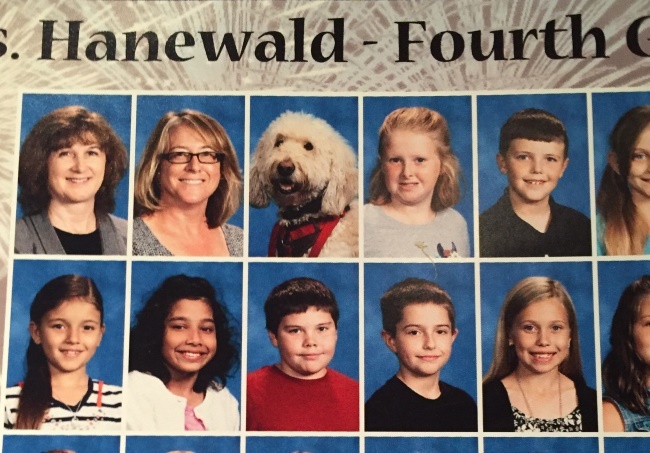 Wonder and Ehlena became heroes among the other students and the school not only placed a photo of Wonder in the “staff” section of the yearbook, but it created a staff ID for the dog. Ehlena Fry and her family, including Wonder, will be at U.S. Supreme Court on Monday so that other kids with disabilities won’t have to experience the humiliation and discrimination Ehlena experienced in kindergarten. It is not only illegal, but it is cruel to make a student choose between her education and her independence. Rather, all students with disabilities should be treated with kindness, dignity and love that Ehlena received in Manchester. A win in the Supreme Court will help tear down barriers to independence for students with disabilities not only in Michigan, but throughout the country. Michael J. Steinberg is the legal director of the American Civil Liberties Union of Michigan. He is one of the attorneys representing Ehlena, along with University of Michigan Law Professor Sam Bagenstos, the Dykema law firm, National ACLU disability counsel Susan Mizner and Claudia Center, and National ACLU legal director Steven Shapiro.